This gluten-free and dairy-free dish of Sautéed Endive, Mushroom and Crisp Pancetta with Wine will melt in your mouth and make your body dance with joy (read on to see why). It will also have your diners asking for more. Shhh plus I snuck in a bonus recipe for the Almond Chicken I served this with at dinner. In fact it was so good I only had time to grab my iPhone to get a picture before it was devoured. This dish was so fast and easy to make and tasted so amazing that I will be making it many more times for sure. Maybe the next time I make it I’ll steal some off to my photo table to get more shots. Let me share just a little about the ingredients before I share the recipe. Endive might be one of those items you passed over in the grocery store because you were not sure what to do with it. Let me assure you there are many ways to enjoy endive but more importantly I’m going to give you the reasons why you should give them a try. 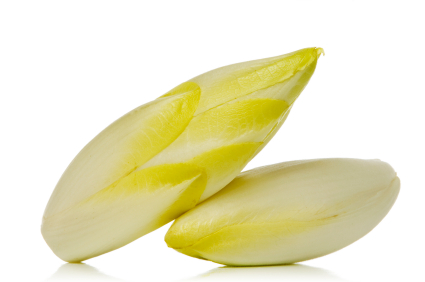 Endive are of course low in calories, fat, sodium and cholesterol free. They are loaded with vitamins and minerals our bodies need such as vitamins B and C, calcium, magnesium, iron, zinc, folate and selenium. Plus they are a good source of both beta-carotene and potassium. If you are looking to have more fiber in your diet and you don’t eat whole grains then endive is a great option since it’s high in complex fibers. It also aids in digestion including helping to remove toxins from your digestive track. Are you sold yet? I love to put them into a pan and sauté or keep them raw and fill them with amazing morsels of shrimp and crab or maybe something as simple as egg salad. They are really very versatile. Don’t forget if you are a smoothie or juice goddess like me, toss them into your morning smoothie and get all of those health benefits in your drink. Mushrooms, especially the Shiitake mushrooms used here are also filled with great health benefits. 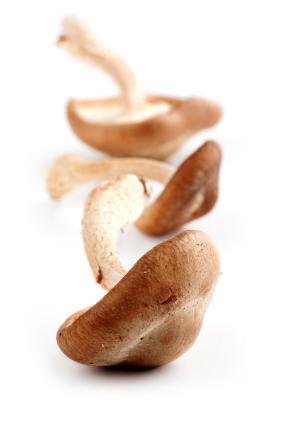 Mushrooms are a great source of your B vitamins and minerals such as selenium, copper and potassium. Mushrooms have been shown to help protect against some cancers and are full of antioxidant power. But here are my two favorite benefits of mushrooms. They are one of only a few sources of Vitamin D in real food, not added or fortified. Plus mushrooms, especially shiitake, oyster and split gill mushrooms contain beta-glucans that have been shown to stimulate immunity in our bodies helping us resist allergies and help in the process to metabolize fats and sugars in our bodies. So now you see why your body will be doing the happy dance with both endive and mushrooms helping your body stay healthy. Now this recipe does include pancetta which you can add more or less or even take out completely to keep this a vegetarian and vegan recipe. Serve this recipe for your best dinner party or your Tuesday night family dinner. Either way, get these great ingredients on to your plate and into your body. First thing you’ll want to do is dice your pancetta and get it started in your pan on medium high. You’ll want this to release the oils and crisp. While this is cooking work on your endive. Cut off the bottom and separate the leaves. If they were small I only sliced them once but if they were bigger I sliced them twice but all lengthwise so you have strips. Once you see it has started to crisp add in the garlic and mushroom. Once that has started to combine add in the endive. Don’t let the endive stick but if the pancetta does don’t worry we’ll get it off when we deglaze the pan. Remove all of that to your serving dish but again don’t worry if some of your pancetta is stuck to the pan. Add in your wine and deglaze your pan by scrapping those little bits of amazing flavor off and into the wine. Simmer for just a few minutes until it reduces. I like to see it cover the bottom of the pan but not by very much. 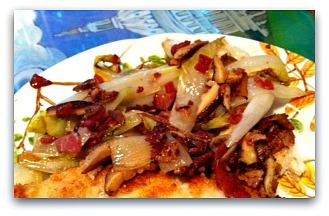 Add the endive, mushrooms and pancetta back into the pan and coat with that amazing sauce you just made. Give it a taste and see if you want to add in any salt and pepper. Remember you can always add more and you may want to let those eating add their own. Put it all back into the serving dish and you are ready to eat dinner. This recipe will serve 2-4 people depending on how many times they go back for more. I served this with Almond chicken which is so easy to make I don’t even consider it a recipe so I’ll give you a bonus here. Pound your boneless skinless chicken breast, coat with almond flour (Honeyville) and cook up in a little oil in a frying pan. See I told you it was too easy. Thank you Shirley. OK, so what exactly is a boot-scootin' boogie? I can't wait to give this dish a try. It looks and sounds delicious! Thank you Ruth. Send me a picture when you do and I'll be happy to share it. This look so easy that even I could whip it up — thanks for another great post, Diane! But on another note, got any suggestions for families not so fond of mushrooms? What not like mushrooms!!!!! I bet you will after trying this dish. Ok you could leave them out but only after you give it a try. It might be one of those foods they don't like YET! Keep up the great work and I can't wait for more! Oh wow… I know I have some endives arriving tomorrow in my organic veggie box delivery. So far it has been one of those few vegetables I had little clue what to do with it. Well, now I am really looking forward to trying out this fab recipe ! wow this recipe looks awesome cant wait to try it. Looks like another delicious Diane recipe. Now that you've graduated from your nutrition program, it's nice to get the nutritional profile with all the usual fun and flavor we expect from you. Not a big fan of mushrooms either but pancetta would make a brown bag taste good so I am going to try this yummy sounding recipe! Simple and healthy…perfect! I see every other button, is there a print button I am missing ? that will make just the recipe print ? Beautiful recipe; LOVE this … and love my mushrooms! xoxo Hope you are well darling!! !